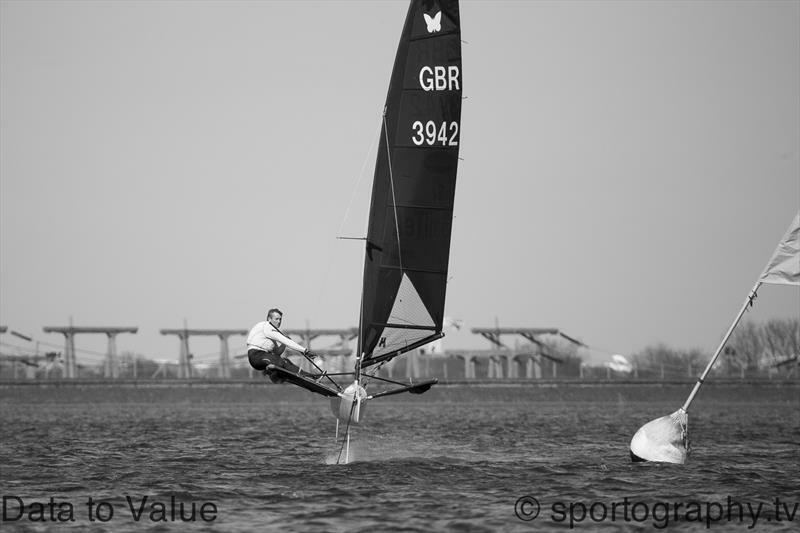 Glamorous weather greeted an impressive turnout of 37 Moths for the first Grand Prix of 2014 sponsored by Data to Value Ltd. at Queen Mary Sailing Club. With a range of abilities from Olympic medallist to complete newbie battling it out in shifty conditions on a crowded reservoir, the event promised to provide some close racing and some surprising results. GPS tracking for the event was ably provided by Trac Trac meaning that the vital statistics from each race could be captured and visualised for those keen to analyse what happened during the races. The 4 races on Saturday featured sunshine and a solid breeze of 6 to 16 knots (most of the time anyway except when you found a big hole and sat there while everybody sailed by). With 7 laps per race at times there was a need for an abacus but the racing was fast and furious with plenty of place changing. The breeze pulsed in and out leaving the fleet at times low riding and at times with a lot on making the turn at the leeward mark! Race 1 started with Ed Chapman showing the fleet how to start in style hitting the line exactly on the buzzer at max speed in his Ninja. Unfortunately for Ed the water temperatures of the reservoir are still very low which led to his boat ventilating and dramatically cartwheeling in front of a swarm of eager moths. He claimed his GoPro footage became corrupted although we suspect it may just be a reluctance to feature in the post racing videos! 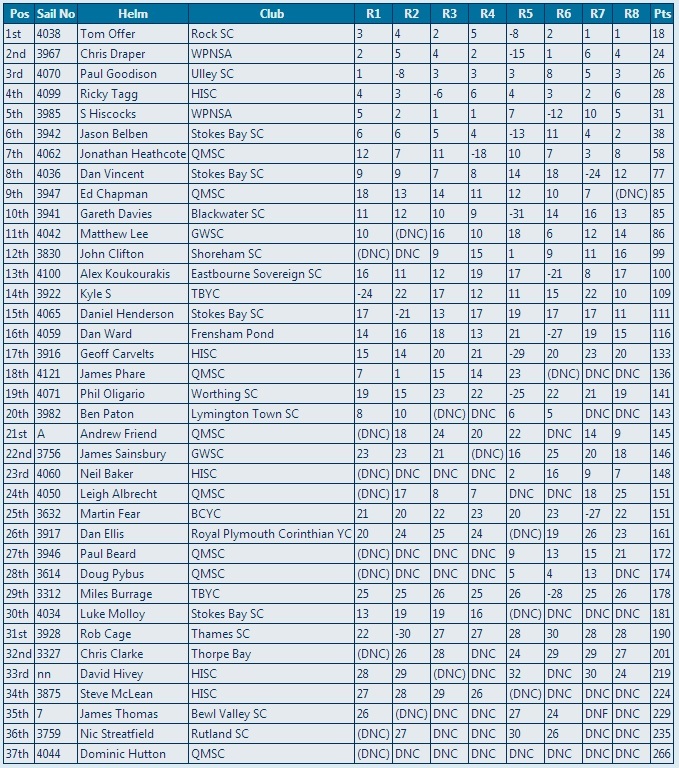 Picking out the shifts and sailing consistently, Paul Goodison proved his mastery of the moth to take victory, closely followed by fellow Weymouth sailor Chris Draper and Tom Offer. Who claims to be from Rock in order to regularly win the furthest travelled prize at events. See the race replay here. The second race saw an exciting start including contact between a certain unnamed America’s Cup helm and a regular mothie. It was however Jason Belben who pulled out a significant lead during the first lap on the competition. The next leg saw Belben however choose the wrong side downwind to be overhauled by James Phare, Ricky Tagg and Chris Draper. Phare held onto the lead to be closely followed home by Simon Hiscocks, Ricky Tagg and Chris Draper. See the race replay here. Race 3 saw most of the fleet head for the far left hand side of the beat to make the most of the stronger breeze with Ricky, Simon and Jason rounding first. Ricky lead until the last few hundred meters of the next downwind when gybing into some light air allowed Simon past into first. Simon then dominated the remained of the race to be followed home by Chris Draper and Jason Belben. See the race replay here. Race 4 saw Ed Chapman and Chris Draper port tack the fleet to great effect leading Simon Hiscocks and Leigh Albrecht round the windward mark. It was however again Simon Hiscocks that dominated passing Chapman and Draper to gain a considerable lead from Draper and Belben. See the race replay here. The fleet then headed home for some complimentary tasty pasta dishes and a refreshing beverage to chat through the days action while watching the paddy’s unfortunately win the rugby. BenPatonRacing.com headed to shore early after only completing two races. Possibly this was to check the trac trac being a true professional that he is or maybe just to get Tinder up and running early?! I hear there may be some video diaries to follow up on his site shortly. Ben I’m not sure missing races should be happening at this level! Sunday brought some unseasonal sunny conditions with one of the main concerns being the sun cream, especially us redheads of the fleet. There wasn’t that much wind but the fleet headed out for some marginal foiling action. The first race saw some major place changes. 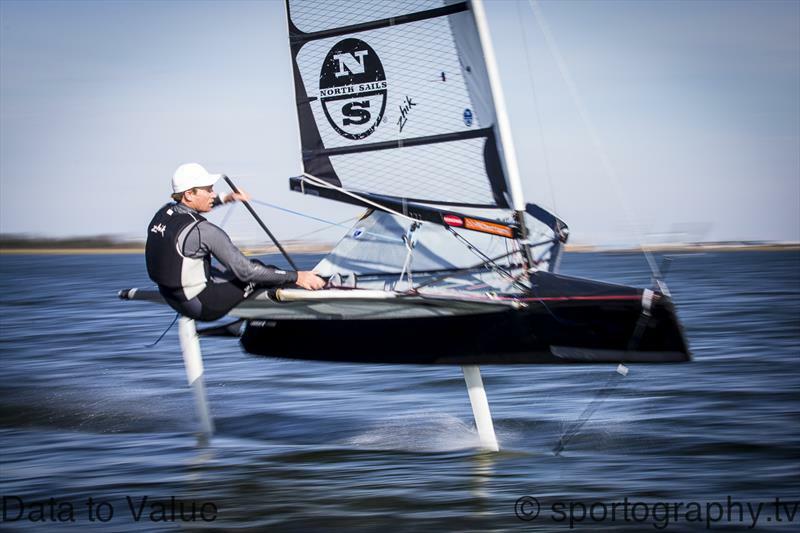 Chris Draper won the low riding race to the windward mark before things got very interesting with boats popping and falling off the foils left right and centre. It was John Clifton who figured it out best to take the win from Neil Baker. See the race replay here. Chris Draper took out the second race with the Exocets of Tommy (special) Offer and Ricky Tagg in hot pursuit. I’m sure a lot of people can say ‘they were winning’ at some point but it was never over until you got through the finish line. 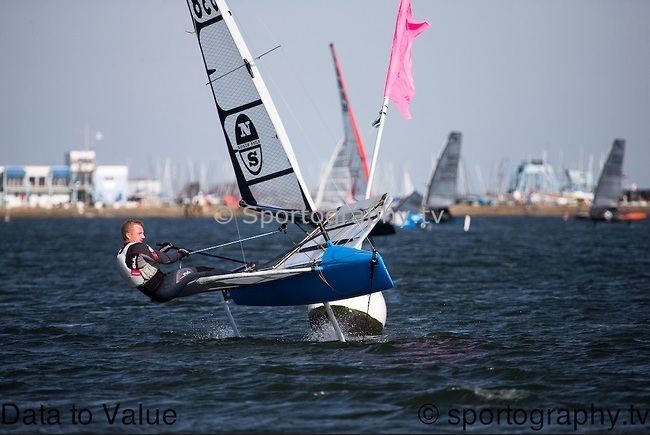 If you’re not foiling its not much fun, especially if others are as they are sailing past! Nobody was quite sure what was happening overall with the big dog Simon Hiscocks struggling a bit in the lighter winds and a mixed bag for the other contenders. The wind had however filled in a bit for the final races. See the replays here and here. Tommy special stamped his authority on the event sailing really well to win race 7 and race 8 and take out the event convincingly from Draper, Goodison, Tagg then Hiscocks. Final results interactive visualised results and statistics are available at www.datatovalue.co.uk/mothopen. 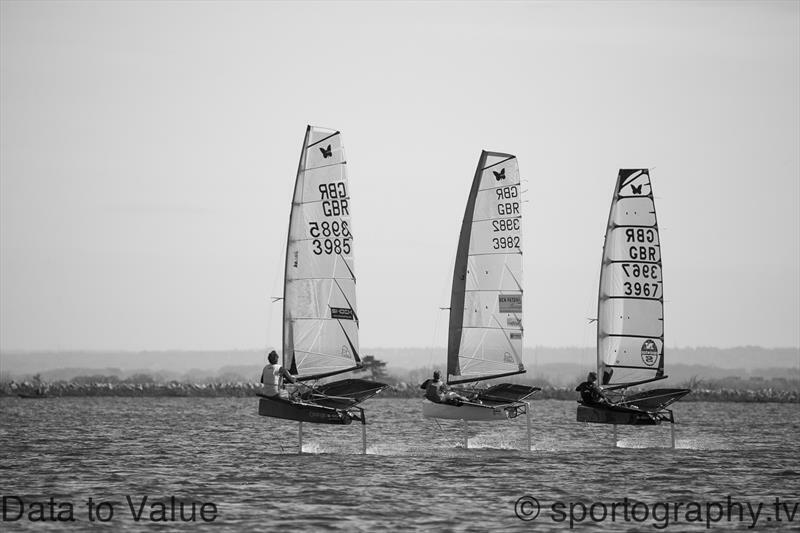 Big thanks to the event sponsors Data to Value, the series sponsors Noble Marine, Magic Marine for the prizes and Alex Irwin from Sportography who got some pretty cool pictures and video of the racing. The next stop Parkstone Yacht Club on 5/6 April, unfortunately I can’t make it, good luck to who ever is 3rd to take this on! Look forward to reading it.